OCEAN CITY – The “heart and soul” of the Crabcake Factory has passed on but his warm smile and dancing shoes will never be forgotten. Just days before Mr. B passed away he was seen at his youngest son’s restaurant dancing to live music during St. Patrick’s Day celebrations, which will carry on as a lasting memory for many. Mr. B was a fixture at the Crabcake Factory, starting at the original location on 120th Street but most recently at the Bayside location on Route 54 as it was located near his Fenwick home. A sign saying “Mr. B’s Corner” has hung on the wall since the restaurant’s opening where he would sit drinking his Mountain Dew enjoying the company of staff and patrons. The Brooks family has come together during this time as he leaves behind his wife Isabelle, his two sons, Ronald and John Brooks, and a daughter, Suzee Nolan. He was preceded in death by his daughter, Kimberly Brooks. Nolan, and her husband, Ken Nolan, as well as John Brooks and his wife, Krista Brooks, will all be sharing a role in filling Mr. B’s role at the restaurants as they all live close by. Mr. B has seven grandchildren, Sam Nolan, Emma, Ella, Elissa and Emelia Brooks and Curt and Delaney Brooks. “Those grandkids are the light of his life and will now keep my mom going hopefully for years to come,” John Brooks said. According to John Brooks, Mr. B had a knack for leaving notes but as technology advanced his notes turned into text messages. “He had just sent me a text saying ‘My goal is to make it to 90 [years old] son, then I can talk with all the girls [John’s children] and they will remember how much ‘P’ [short for Grampy] loved them,” John Brooks said. A long-time Crabcake Factory employee will be building a memorial on the eastside of the Bayside location to remind all to remember Mr. B at sunset. A new tradition is also taking place at Crabcake Factory as a daily toast will be made in Mr. B’s memory at happy hour, as well as during University of Maryland Terps games. Many knew Mr. B as an avid Maryland Terps fan. He was a three-sport star athlete at Anacostia High School in Washington D.C., and received a full scholarship to the University of Maryland to play basketball in 1950 even though baseball was considered his best sport. Mr. B played for legendary coach Bud Milliken, and with All American back court mate Gene Shue until graduation in 1954. After college, Mr. B completed his education as an Air Force jet pilot and was stationed in Ann Arbor, Mich. until 1958. Mr. B and Isabelle Brooks were married on Nov. 25, 1966 and resided in Bethesda. Mr. B opened Brooks Advertising in Washington D.C. and was president of the Downtown Jaycees. In 1996, he relocated to the Eastern Shore. Mr. B organized the Terps on the Shore Golf Tournament benefitting many local and national nonprofits for 17 years like St. Jude’s, Wounded Warriors, Coaches for Cancer as well as his favorite cause — Ocean City youth sports. Lefty Driesell was the Honorary Chairman of the last several sharity events Brooks put on. “Mr. B” could be found many days in the summer at the youth camps held at Northside Park in Ocean City helping out. “He always had time for kids not matter what and loved Hondo Handy and the folks up there,” John Brooks said. For his youngest son, it is still hard to believe he is gone. 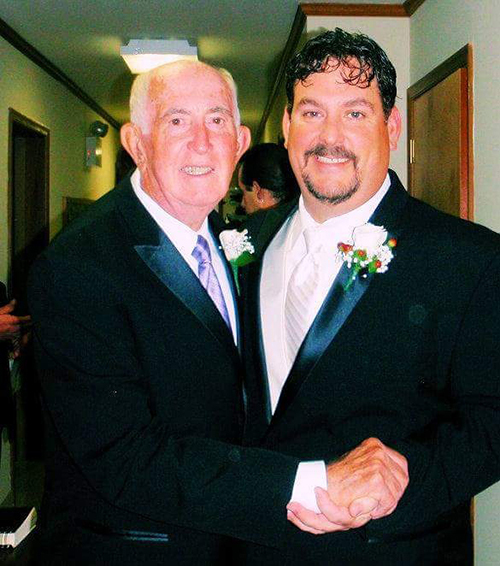 “A lot of people didn’t get my dad’s and my relationship because they only saw what we allowed people to see in public … my father was not only the heart and soul of the business for almost 20 years but he was and is my heart and soul. Just like me, the business will go on and new generations of the family will pitch in and help us keep up his tradition of being more than just a restaurant. He considered these people his family and if there’s one thing I realized this week is that all of them were affected by his passing. I got to spend the last 20 years of my life seeing my Dad on a daily basis, almost like living with him, so there were some battles and differences of opinions for sure but at the end of the day regardless of what he did he was my father first, my friend second and my partner always,” John Brooks said. It has been a week since Mr. B has gone and for his family every day it gets a little easier.